The VI government is warning residents about the emergence of the Stony Coral Tissue Loss Disease. The Department of Planning & Natural Resources Division of Coastal Zone Management said SCTLD is a lethal coral disease affecting roughly half of the coral species in the US Virgin Islands. It was recently found on St. Thomas. Cause of the disease is unknown, but we know that it is transmittable through water. SCTLD attacks stony corals, like brain and pillar corals, first, and moves quickly leaving behind large areas of bright white skeleton. SCTLD doesn’t pose a threat to human health, but damages corals that provide food, tourism value, and physical protection from waves during storms. DPNR is asking the general public to be on the look out for this disease when you are swimming, snorkeling, or diving throughout the territory. Look for large areas of bright white skeleton on corals, especially on brain and pillar corals. Report sightings and tell others if you think you see something suspicious. Visit www.reefconnect.org/bleachwatch and download the Bleach Watch app, or report directly through the website. Be sure to include photos and location information. 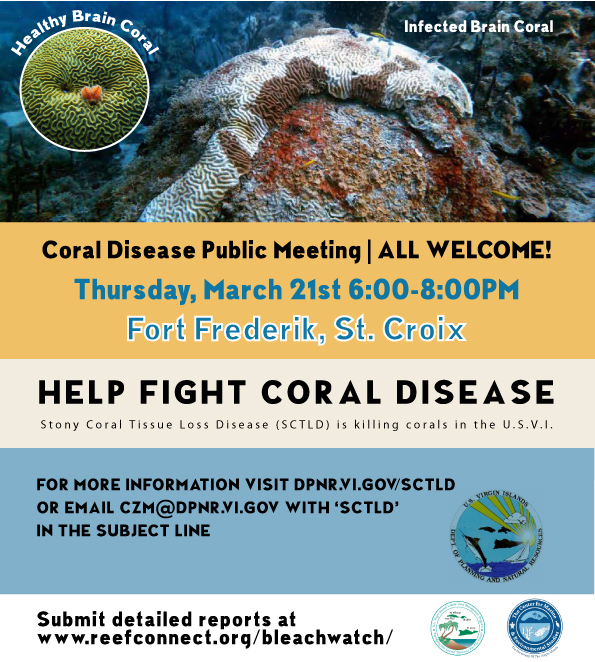 A public meeting is scheduled for this Thursday, March 21st at 6:00PM at Fort Frederik, St. Croix. This is open to everyone, invite your friends. Information will be published on the Coastal Zone Management website at dpnr.vi.gov/czm/SCTLD as well as on the DPNR Facebook page.